It’s finally happened. After months of rumors (and one un-remembered tease where he waked out), Seth Rollins has turned his back on The Shield. In one of the most profound turns in recent memory, the one-time Tyler Black sold out – attacking Roman Reigns and Dean Ambrose, and relocating to the greener pastures of Evolution and, in essence, The Authority. It was absolutely awesome. That’s what has me worried. Rollins is a great worker, and a big deal. His turn was (and still is ) a very big deal. The ending of the Shield in itself is a big deal, and opens the door for a lot of great storytelling. So what’s with the worry? My fear is that WWE isn’t so much behind the Seth Rollins brand, so much as it is interested in liberating the Roman Reigns brand. Confused? I’ll elaborate. There have been some pretty extensive rumors about Roman Reigns breaking out to be a top star, and working a program with HHH, sending him ever –closer to his fate as a future WWE World Heavyweight Champion. That’s good. But it leaves the futures of Dean Ambrose and Seth Rollins in serious, serious jeaopardy. 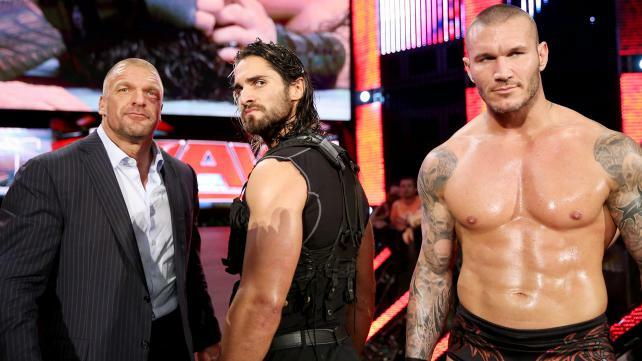 My fear here is that WWE will use Seth Rollins as a fall-guy for the Authority and Evolution. The first of three to take a Superman Punch and spear, and lay on his back for a three count. A stepping stone for the future champion, rather than a future champion. Seth Rollins is too good to be a simple stepping stone. If Roman Reigns is your next (Samoan) John Cena, then Seth Rollins could easily be your next CM Punk. He’s got the (eerily similar) look. He’s got the work. He even as the same pedigree, as a former Ring of Honor World Champion and developmental standout. He’s better than good. There’s a reason he was dubbed “The Architect” of The Shield, and referred to as the glue that bonded the group together. It’s the truth. If Roman Reigns is getting a rocket strapped to his back for a trip to the top of the mountain, it can’t be at the expense of Seth Rollins. Rollins needs to be a big deal, and not just a decent hand who gets crushed on Roman Reigns’ road to the championship. In a world where WWE World Heavyweight Champion Daniel Bryan was more “making chicken salad out of…” than “the plan all-along,” I’m not so confident about the plan going forward. As a fan of the Shield, as a fan of Seth Rollins and the current product as a whole…I’m going to try to remain cautiously optimistic, but I’m no fool. I know when things look too good to be true, and I know when someone is being built up, to build someone else up to look good for Triple H. If you think this is anything but, well…I’m afraid I’ve got some bad news. If this is all building up to a match between The Game and Roman Reigns… everyone else is just a pawn in a much bigger game. If you’ve ever read ANYTHING on this site, you know Nick LOVES the former Alexander himself, Rusev…and to a slightly lesser extent, his ravishing Russian counterpart. He thinks he’s awesome, and loves Lana. That’s where we agree. Regarding Rusev’s momentum, however, we seem to be on different planets altogether. Nick feels Rusev is on a big, fat Russian roll. While I like Rusev, I just don’t see what Nick’s seeing. Yes, Rusev has been rolling through competition (though I may be using that term a bit too generously. Thanks for coming, Zack Ryder!) . Yes, Rusev is really impressive in the ring, especially for a big guy. Yes, he has a strikingly gorgeous mouthpiece who adds a lot to his act. I think part of what is bothering me is that WWE seems to be relying on cheap, dated heat-building methods. Stupid Americans, Putin, Snowden…cheap heat. The crowd shrugs, because we heard it all before when Sgt. Slaughter praised Saddam. The “this guy is a national treasure” ceremony on Raw was a big step In the right direction for Rusev. Show that the guy is the best athlete in Russia, and is here to prove he’s better than any wrestler in the WWE. Let Lana lay into the WWE superstars for not being on Rusev’s level, instead of laying into the fans for not being Russian. Also, I’d really like to see Rusev have the kind of matches he had in NXT. It’d do more for Rusev’s popularity to let the crowd see him WOW with guys like Dolph Ziggler, than to repeatedly maul guys like Zack Ryder. There’s NO EXCUSE for a guy with Rusev’s size and talent to fizzle out. There’s still plenty of time to make sure it doesn’t happen. I’ll say this, though. It’s not all bad. RUSEV, CRUSH! is fantastic. It gives fans something to anticipate, as well as participate in. If Cena’s Five Knuckle Shuffle and “You can’t see me!” taunt has taught us anything, it’s that audience participation adds a lot to a match, and helps provide that “big fight feel” we keep hearing about. In this case, it’s the Russian equivalent of dropping the straps in Memphis. Also, Nick and I agree that it’s nice to see Rusev is NOT an emotionless Russian robot. He’s a beast, but a beast that reacts, holds the ropes open for Lana, tenderly holds her hand high in celebration, and most importantly – HE REACTS. He reacts to Lana. He reacts to his opponents, and their attacks. He’s a big, scary man – and he’s paying attention. That’s terrifying, and it’s damn good. Michael Cole is great. He’s not Jim Ross, Vince McMahon or Gordon Solie, but he’s still damn good at what he does. People act like he’s terrible, and pretend he should call shows the way the announce team called Takeover, but let’s face it –Michael’s job is to do MUCH more than call matches. It’s to sell pay-per-views, merchandise, storylines, Network subscriptions, reality TV shows…you name it. But while Cole is good in his spot, there are more than a few guys who could stand to learn a thing or two from the best in the business. And I’m not referring to the voice of the WWE. I’m referring to the last one. Jim Ross is a free agent…and only because WWE chose to let him go. He should be spending his time down at the Performance Center, working with newer announcers on mastering the craft, and also working with young talents on their promos. If there’s a guy who just gets it, it’s Jim Ross. If there’s a guy who gets why he’s not being utilized by a major pro wrestling organization at any level…. Well, I’d love an explanation. If you still need proof J.R. can go, check out his most recent work. J.R. did commentary for a boxing fight, and it was pretty excellent. Not only does he clearly understand what he’s talking about, he’s witty and funny, and peppers in some pro wrestling to boot. Just think…WWE chose to silence this voice. And with that… we’re done for today. I’ll be back later in the week to celebrate #HeenanWeek, with the return of the Indy Spotlight.